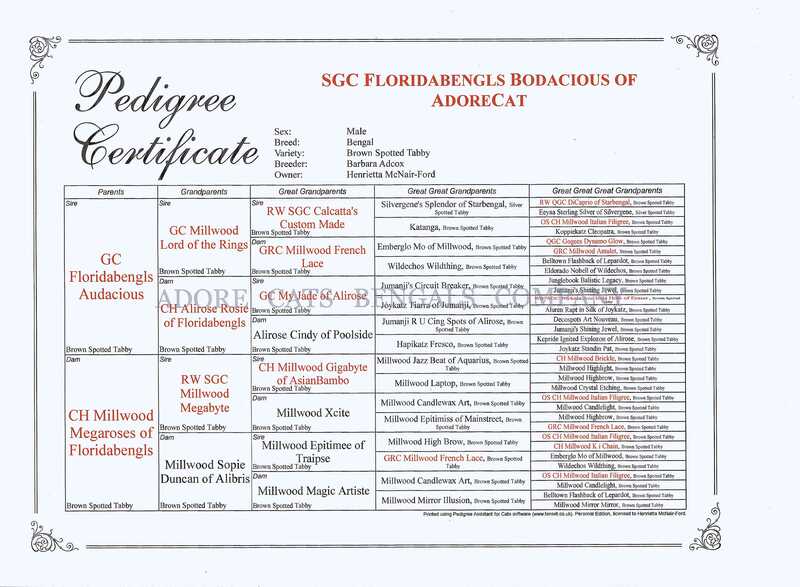 This is the pedigree for Supreme Grand Champion (SGC) Floridabengls Bodacious of AdoreCat. His mother and the majority of his close and distant ancestors are from Millwood Cattery. Bodacious and all of his ancestors are registered Bengals with TICA and/or ACFA and many are titled. He is truly an outstanding Bengal cat. *Note: The pedigree below is for general information purposes only. Those who purchase one of Bodacious’s kittens will receive a pedigree that has the registration numbers for each cat listed.